In February 2018, SEAT fully acquired Madrid car-sharing company Respiro with the intention of becoming a benchmark mobility solutions provider. Included in SEAT planning was the gradual replacement of existing rent-by-the-hour vehicle stock with SEAT models powered by Compressed Natural Gas. That day has arrived. SEAT has integrated 173 compressed natural gas (CNG) cars into the fleet, which will be able to freely access the Madrid Central area thanks to its ECO label, reports Diariomotor. Madrid Central is a zone of restrictions in the center of Madrid in which it is sought to reduce by 40% the limits of the concentration of polluting emissions due to traffic. With this objective, the new regulation limits access exclusively to vehicles with the ECO or ZERO environmental sticker, regardless of whether it is a private vehicle, carsharing or any other type of rental. 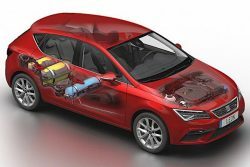 Seat is able to draw from an increasingly diverse range of bi-fuel natural gas powered vehicles, not only from its own list of models but also from Volkswagen’s commercial range. These recent models are all capable of performance equivalent to conventionally fueled vehicles while delivering improved economy and reduced vehicle emissions. Available SEAT models include new Mii, Ibiza and León.